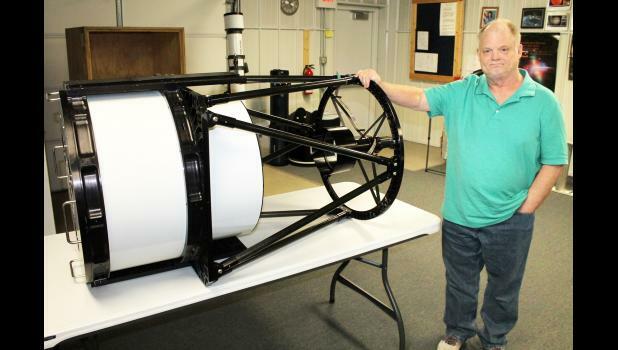 For nearly 15 years, a 20-inch reflector telescope served the scientific needs of Holton’s Elk Creek Observatory and its successor, the Banner Creek Science Center and Observatory. Last June, however, the telescope’s control box was “fried” by a bolt of lightning, rendering the tele scope “useless,” according to longtime Holton educator and science center director Mike Ford. Replacing the telescope, Ford noted, was likely to cost $120,000, telescope, control box and all. But thanks to the generosity of science center supporters, the 20-inch telescope is about to be replaced by a slightly larger telescope ― a Planewave 24-inch telescope that Ford said will expand the science center’s capability for studying the stars by about 60 percent ― and fund-raising efforts to achieve that goal are nearing an end. “It’ll be a big deal,” said Ford, whose efforts opened the former Elk Creek Observatory behind Holton High School in 2000 and who has played a major role in developing the Banner science center.